Last week, we reviewed Mirage block’s attempt to tie more than one set together. This week, the Rath Cycle takes things a lot further: they had a real plan for an entire block (rather than just a set or two) where everything is tied together by the story of Gerrard and the Weatherlight. The bad aspect is, similar to Homelands’s focus on setting and story above all else, all three sets in the Rath Cycle showcase the plot to the exclusion of showing nearly anything else. This leaves it feeling less like the interesting world shown in Mirage block, and more like a bunch of somewhat-related characters going around doing whatever. This block, it seems, would teach them that telling a story isn’t really the best way to progress a block. But we all start somewhere, and the Rath Cycle had a lot of good parts to it. It was the first large expansion to actually, really, legitimately get designed by Wizards of the Coast. Alpha was Garfield with his friends playtesting it, Ice Age was Skaff Elias and his value-oriented buddies, Mirage was Bill Rose and co., but Tempest had employees of the company paid to make cards. More accurately: everyone that had to that point been solely developing, including Mark Rosewater, finally got a chance to put their favorite cards and mechanics that they came up with in the set. This makes the Rath Cycle feel like a mish-mash of a lot of different ideas without much unity. There’s the storyline aspect of “the crew is here on this plane,” but there’s no big mechanical idea like they had attempted in some previous sets (and most of the future ones). The upside, though, is that it got all their best one-off ideas. Musicians often have their debut album as their best, because it comprises their strongest work that they’ve done over the years between beginning to make music and releasing it. Rath Cycle has a similar advantage, with the best mechanics they’d invented. Tempest was designed with fifteen separate mechanics. Some of them would get used later, like cycling and echo in Urza’s Saga, and specific cards like Mindslaver would get used many years later. Buyback immediately became one of the game’s most popular keywords. Regardless of player type, it hits all the right things: it’s cool being able to reuse your spells over and over again, and tournament players drooled over the value that Whispers of the Muse gave them. It’s a twist on spells that basically makes them enchantments with an activation, and that dual-modality leads to a lot of interesting gameplay. The design criticism is that they can lead to repetitive gamestates, but that’s no different than any permanent with a repeatable activated ability. The fact that one could, theoretically, cast it over and over again in the same turn, or use it every turn till the end of the game, gives it a very good best-case scenario, which gets people excited. The idea was that buyback would get introduced in Tempest with a straightforward implementation, then a twist in Stronghold, then further variation in Exodus. This didn’t come across perfectly; I didn’t know that Stronghold had the ones with colored mana in the buyback cost, whereas Tempest had only colorless costs, because that’s such a minor distinction as to be almost inconsequential. 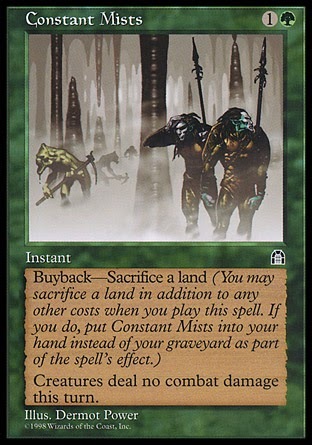 Exodus was supposed to be the set that had buyback with non-mana costs, but Constant Mists didn’t get the memo on that one and snuck in early. Slivers are, hands-down, the biggest success of the block. Perhaps most amazing is how popular they were despite only having only eleven in Tempest (a common two-mana cycle, an uncommon three-mana cycle, and Metallic Sliver), six in Stronghold (a cycle of allied pairs and Sliver Queen), and zero in Exodus. Everything about them oozes cool. What’s the best part about making a tribal deck? Lords, definitely. They give you a reason to play all those otherwise-underwhelming creatures. So what’s the best possible tribe? EVERYTHING IS A LORD. Yes! It takes a person roughly five seconds after seeing them for the thought process to go through their head: “oh, so it’s okay on its own… but with this other one- and then the- and if I have these five…“ This isn’t limited to the most casual of players, though it was and still is incredibly popular with that group. I’ve made more than one attempt at a tournament Sliver deck. More Sliver decks get designed per-card than practically any other group of cards. The most surprising thing, going back to the Tempest ones, is that they were pretty underpowered. The two-mana cycle was all 1/1s (well, Muscle Sliver only on a technicality), and the uncommon cycle were Grey Ogres that gave all Slivers two-mana activated abilities (Horned Sliver deviated from this). 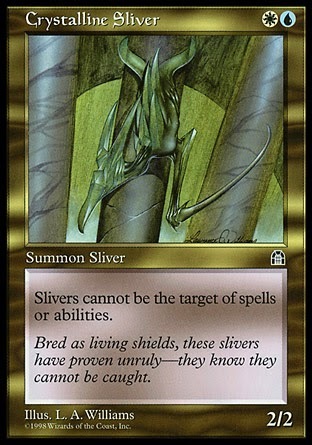 The Stronghold cycle, save for the phenomally powerful Crystalline Sliver, gave rather unexciting activated abilities. But they were something more special than a couple cards: they were a concept that stuck with people. It’s a five color tribe. It is, as previously stated, ALL LORDS. They have a brilliant unifying look to them, which each artist presented in a really unique way, from Kirschner’s bold simple designs to Ron Spencer’s emphasis of their threatening spikiness. You don’t need more than 17 cards to hook people. Yes, I know that some of these saw tournament play. 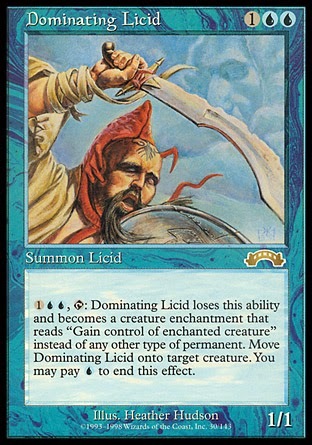 Another tribe introduced in the Rath Cycle: Licids! This seems like a case of someone introducing an interesting-sounding idea, getting interrogated about how it works, kind of shrugging a bit, but they still think their core idea is good, and they convince people that the awful templating it’ll need is no big deal. This is the dark side of top-down designs, because you can’t just vaguely explain what something does. You have to put it in text, and that text interacts with the game state, and so the text mentions losing abilities and changing types and ending the ability for a mana cost. Someone really should have woken up, looked at the cards, declared “these look awful,” and cut them. The sad part is that Dominating Licid is actually pretty powerful, but the horribleness of Licid design stops almost anyone from using it even in Cube. Finally, we have Shadow. It’s a variant on evasion that makes your creatures never interact with your opponent’s, which is fine for a few smaller creatures here and there, but when half your attackers are completely unblockable… it makes things a bit uninteresting in terms of attacking and blocking. 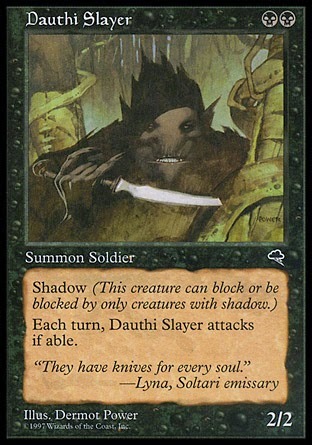 Dauthi Slayer’s “attacks each turn” clause might be one of the most pointless in Magic, because it’s practically unblockable and can’t block. What else are you going to do with it? The developers of Tempest didn’t even cost Shadow as if it was an evasion ability, but rather like it was neutral. This was a bit naïve, but due to the huge spike in creature power we’ve seen, it makes Tempest’s shadow creatures seems pretty reasonable by modern standards. In the context of the block, though, it was a really bad idea to allow people to kill their opponents in Limited on turn six every game. Part of the point of having creatures attacking and blocking is that they’d, well, block, instead of Dauthi and Armodon sailing by, attacking on two entirely different planes of battle. This is paraphrased from Benjamin Peebles-Mundy, who drafted a ton of the block, and even wrote a guide with pick orders. And speaking of those aggressive creatures, Tempest pushed the constructed formats to previously-unheard-of speeds. Sure, Sligh had seen play already, but that relied on two-mana 2/2s with disadvantages, and for everyone else to be playing either horribly top-heavy decks or paying all their life to Necropotence. Rath Cycle brought playable 2/2s for one mana, two-mana practically unblockable 2/2s, and spells like Hatred that could end the game instantly. Still-prevalent strategies like red aggro and white weenie really got their start with Rath Cycle, as well as our dearly departed Suicide Black. I doubt this one is ever coming back. Hatred is unprintable now for any number of reasons, Phyrexian Negator would be unplayable, and Dark Ritual which powered the whole deck is definitely gone. You might think of this as more “Magic history” than a design review, but choosing what aspects of the game to push or weaken are absolutely design decisions. They emphasize the part of the game that they want people to focus on, and what Rath Cycle emphasized was the mana curve. Sure, there was a big splashy dragon everyone liked: Rathi Dragon, your four-drop after your opponent was nearly dead. 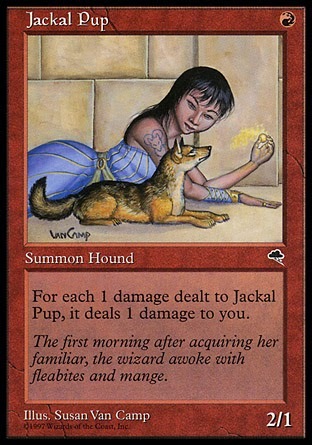 The game would swing back away from this for a long time, and Jackal Pup would, for its power level, be considered aggro’s equivalent of Mana Drain and Necropotence. In one of the all-time greatest “look how quickly things change” mothership articles, Randy Buehler explained why a 2/1 Goblin that can’t block for R is wildly unprintable, and if you in any way disagree, you don’t belong in R&D. Because of R&D production cycles, work on Shadowmoor was probably going on in 2005, and that ended up with a way better version of Lazy Goblin. You might notice that I’m not really distinguishing between Tempest, Stronghold, and Exodus. The reason is that they feel extremely interchangeable to me, like they could have been released as one really big set. They have returning mechanics, but so little evolution that with very few exceptions, any card printed in one set could have been in the other ones. The Spikes only had one card in Tempest before going on to more things in the other sets, but that’s not exactly something to base a design around. So how did the Rath Cycle do, as a holistic block? It advanced things a lot. Cumulative upkeep and world enchantments, previously evergreen parts of Magic, were gone forever, thank god. With very few exceptions, the development of the sets seems very good. Reviewing the early sets, I got used to the pattern of buttloads of chaff, followed by a few format-definingly-broken cards. Rath Cycle certainly had its better cards, but a lot of them were powerful in very open-ended, interesting ways. These are my favorite kinds of cards, because they don’t try to guess what you’re trying to do with them and restrict that. They reward creativity and exploration rather than matching the card that rewards playing artifacts with good artifacts. Even when Survival of the Fittest is too good, it’s too good in a much more interesting way. This is more something for my Cult Classics series, but Extended seemed like it was more defined by Rath Cycle’s build-arounds than almost anything else. 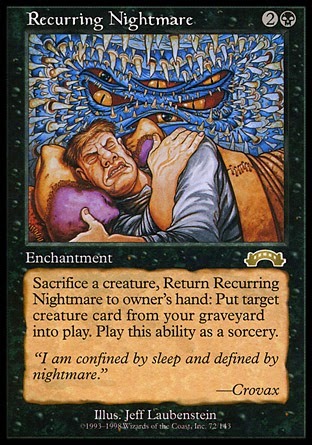 There’s the classic Recurring Nightmare/Survival of the Fittest combo, staple of Legacy cube drafts; the latter card only became too good for Legacy when Vengevine was printed. Oath of Druids was a strong deck in Extended for about seven years before it received a ban that was more of a lifetime achievement award. And on and on: Goblin Bombardment in Fruity Pebbles/Cocoa Pebbles, Hermit Druid with graveyard cards that were printed later, Aluren in a dozen different incarnations, Dream Halls in some of the most ridiculous decks of all time, Volrath’s Shapeshifter with Survival, and Earthcraft with Squirrel Nest (this one didn’t last long). Manabond is the prime example of the open-ended card that didn’t become good until much later, even making Ben Bleiweiss’s top 40 in a rundown of the worst cards of all time. I wasn’t playing Magic when these sets came out, but I really wish I had been a deckbuilder back then. The possibilities really do feel infinite when looking at those cards. I get similar feelings looking at Recurring Nightmare and Tradewind Rider as I do Protean Hulk and Bridge from Below, and those are wonderful feelings. Tons of cards from this block have become classics of casual play, like Burgeoning, Grave Pact, and Awakening. It’s for a good reason: you can tell just from reading them that they’re fun to design decks around, or slot into existing piles. As far as the aesthetics, Tempest marks a big change. Sue Ann Harkey’s art direction gave way to Matthew Wilson, whose good-though-unspectacular illustration serves as a reasonable baseline for what art in this era would look like. 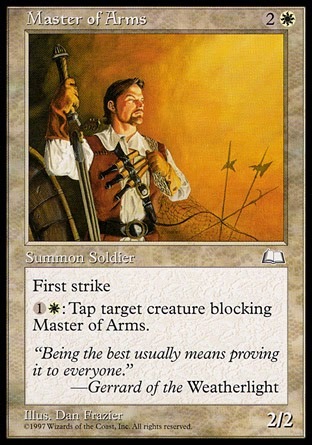 More importantly, though, was that Magic now had a style guide. Artists were told exactly what Gerrard, the Moggs, and all the other races and characters of Rath looked like. The good part is that artists were free to portray them using their own style, so DiTerlizzi’s picture book-style Hanna would be wildly different from Terese Nielsen’s more refined portrayal. It serves as a bridge from early Magic artists like Richard Kane Ferguson and Quenton Hoover to show that style guides didn’t diminish the quality of their work in the slightest. This is a big annoyance of mine when people complain against modern Magic art (a complain train I’m usually on): they blame the existence of the style guide for everything looking similar. No, style guides don’t mandate that everyone illustrates the same. This happens when you get artists that all have similar styles. To compare to comics, Daredevil has been illustrated in many different unique ways. That art is work that is recognizably that artist’s, while still being recognizably Daredevil. There is more than one way to illustrate a character. Overall, the block has the look of very professional, high-quality fantasy illustration. There aren’t many outrageously low-quality pieces like previous sets have had, and as a whole, it looks like it could be illustrating a long cartoon about Weatherlight, which is an idea I’m much more fond of than the crew of the Weatherlight. For anyone wondering about the reason for these constant digs at these characters, and the plotline in general: I find the idea of a running plot to Magic at best unnecessary, but mostly silly and absurd, without the necessary introspection to recognize or play at its own absurdity. These characters would show up on card after card despite interest from only the very most lore-obsessed of the fanbase, and the characters’ constant fights and bickering and dumb flavor text makes the whole thing seem like an interplanar soap opera. Even if I was the sort of person who was interested in this sort of high fantasy/adventure/melodrama stuff, this seems like a bad implementation of it in the wrong place for the format. And the novels! Holy god, the novels. They are unreadable. If the goal of making new Magic cards is to make cards that people want to play with, this block is a huge success. They’d try in future years to give the blocks more thematic unity, and give specifics sets more mechanical definition, but that wasn’t successful for several years. The Rath Cycle was a high point for this area in Magic history. Next week: we break Magic. Welcome to Urza Block. "The design criticism is that they can lead to repetitive game states, but that’s no different than any permanent with a repeatable activated ability." 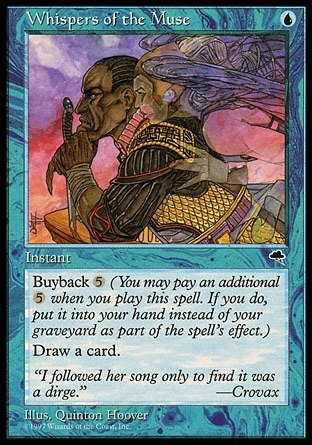 No equivalent for Corpse Dance comes to mind, but I guess you realize that the buyback spells are way better, mainly because their counterparts were legal and nowhere to be seen in tournaments of the same format. Why is it that a spell that makes you pay 6 mana or 3 mana and discarding two cards each time you want to use it sees more play than their counterparts who require a single payment of 4 mana, repeatable payments of 3 mana (half the price), or repeatable payments of 4 mana (no card disadvantage)? Because there are millions of ways to deal with permanents in general and creatures in particular, but very few to deal with spells in hand or on the stack. 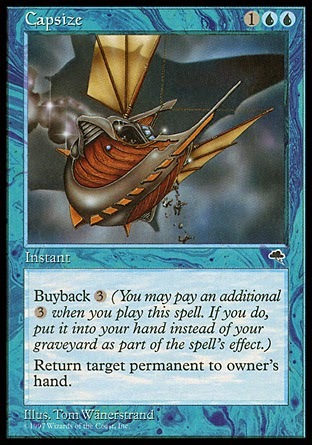 It's ironic that blue and black, the best decks at that, were also the ones with the best buyback cards. Or maybe not, considering blue was the best at everything back then. The best buyback cards in TSP block were Spell Burst (in Tron decks in TSP Standard) and Sprout Swarm (a total beast in Draft). Not much to write home about, but still - you'll never found such a resilient counterspelling or token producing permanent. Mostly because they die as soon as they appear on the horizon.